Weddings Are A Piece Of Cake! …Or Are They? Sometimes the best traditions are the ones we make ourselves and the cake is no exception. An old supervisor of mine got married at a picnic area outside of Hershey Park. The town of Hershey is charming and filled with clever nods to the ubiquitous candy bar. 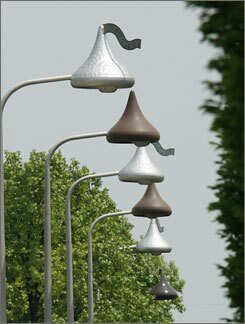 Out of all the kitchy touches, my favorite are the Hershey Kiss shaped streetlamps. The area is permeated with a savory olfactory smackdown of chocolate scented air from the factory. The wedding was a morning affair, with a light luncheon picnic, and then the reception was–you guessed it–riding the rides and touring the park in our wedding attire. And, of course, the dessert was each guest received a simple bar of Hershey’s chocolate with delightful personalized wrappers. Instead of a photobooth, the bride and groom had arranged to purchase the souvenir roller coaster images of our groups, similar to this family’s photo. One of the traditions that didn’t even come to pass was the traditional three tiered wedding cake and its cutting. We didn’t notice, mainly because the whole affair was simply different than most weddings from soup to nuts, but still…it was exciting that the couple bucked tradition and went with their own wedding themed chocolate-lovers dessert! 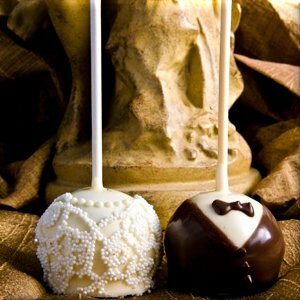 Cake pops are all the rage, thanks to Starbucks Petites line of treats. Wedding cupcakes are the perfect serving size! 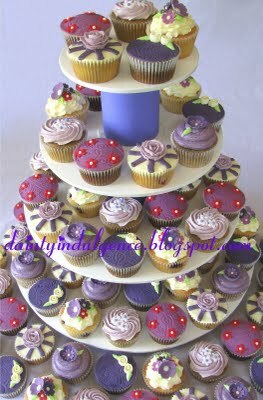 You can order many different flavors, have multiple designs, and stack them in adorably creative ways. Have a dessert bar, like this elegant design. Multiple options allow for every guest to pick and choose whatever tickles their fancy! Nothing beats the simplicity and joy that comes with making your own ice cream sundae! Trays of petit fours, monogrammed with the couple’s intials, make excellent dessert alternatives. If you aren’t from the East Coast, you might not know the magic of the Whoopie Pie. They come in all flavors and colors, and most importantly, are irresistible. Weddings, especially casual ones, feel like a good ol’ fashioned family reunion. And, for my family, that means pie! And lest we leave out the couple who loves each other only slightly more than they love chocolate, the truffle tower! Most importantly though is to find a dessert that says, “Hey! We just got married! Let’s celebrate!” For some, cake can do no wrong; for others, giving folks something unexpected is key. Either way, just remember: save me some!